- CHIKARA Tag World Grand Prix '06, Night Three (February 26) = In a non-tournament match, Player Uno, Max Boyer, SeXXXy Eddy, & Triple Dragon defeated Larry Sweeney, 2.0, & The Heartbreak Express. - CHIKARA Sand In The Vaseline (April 21, '06) = Player Uno lost a "Prince Raymond Torres of Brunei Rules" Match to Dr Cheung. - CHIKARA Young Lions Cup IV, Night One (June 23, '06) = Player Uno lost in the opening round of the Young Lions Cup Tournament to Don Paysan. Arik Cannon won the tournament. - CHIKARA Young Lions Cup IV, Night Two (June 24, '06) = In a non-tournament match, Player Uno, Dragon Dragon, & Equinox took down Max Boyer, Darkness Crabtree, & Don Paysan. - CHIKARA Young Lions Cup IV, Night Three (June 25, '06) = In a non-tournament match, Player Uno & Ricochet were beaten by Chuck Taylor & Cloudy. - CHIKARA Cibernetico Forever (October 28, '06) = Player Uno fell to Excalibur. - CZW Night of Infamy V (November 11, '06) = Player Uno was beaten by Beef Wellington. - CHIKARA Brick (November 17, '06) = Player Uno lost to Max Boyer. - CHIKARA Talent Borrows, Genius Steals (November 18, '06) = Player Uno won over Jagged. - CZW Cage of Death 8 (December 9, '06) = Player Uno, Gran Akuma, Niles Young, & Icarus fell to Max Boyer, Chuck Taylor, Beef Wellington, & Ricochet. - CHIKARA King of Trios Tournament '07, Night Two (February 17) = In a non-tournament match, Player Uno fell to Icarus. - CHIKARA King of Trios Tournament '07, Night Three (February 18) = In a non-tournament match, Player Uno & Create-A-Wrestler competed in a "17-Team Tag-Team Gauntlet" Match, which was won by Up In Smoke. - CHIKARA Anniversario? (May 26, '07) = Player Uno was beaten by Shayne Hawke. - CHIKARA Anniversario! (May 27, '07) = Player Uno, Lince Dorado, & Pantera won, via DQ, over Mitch Ryder & Los Ice Creams. - CHIKARA Young Lions Cup V, Night One (June 22, '07) = Player Uno beat Niles Young, then lost a "Six Man Elimination" Match to eventual winner Chuck Taylor in the Young Lions Cup Tournament. Lince Dorado, Amigo Suzuki, Ice Cream Jr, and Moscow were the other participants. - CHIKARA Young Lions Cup V, Night Three (June 24, '07) = In a non-tournament match, Player Uno, Super Xtremo, & Moscow fell to The Order of the Neo Solar Temple (UltraMantis Black, Crossbones, & Hydra). - CHIKARA Showdown In CrisisLand! (July 21, '07) = Player Uno was beaten by Ophidian. - CHIKARA The Sordid Perils Of Everyday Existence (November 17, '07) = The Super Smash Brothers (Player Uno & Stupified), Tim Donst, & Mike Quackenbush fell to Robbie Ellis, Mitch Ryder, & F.I.S.T. (Gran Akuma & Icarus). - CHIKARA Chapter 11 (November 18, '07) = The Super Smash Brothers & Shane Storm lost to The Colony (Fire Ant, Soldier Ant, & Worker Ant). - CZW New Years Resolutions (January 12, '08) = The Super Smash Brothers were taken down by Greg Excellent & Beef Wellington. - CHIKARA King of Trios Tournament '08, Night Two (March 1, '08) = Team IWS (The Super Smash Brothers & El Generico) won over Team F1rst Wrestling (Arik Cannon & North Star Express), then fell to eventual winners Los Luchadores (Lince Dorado, Incognito, & Pantera) in the opening two rounds of the King of Trios Tournament. - CHIKARA King of Trios Tournament '08, Night Three (March 2, '08) = In a non-tournament match, The Super Smash Brothers competed in a "Tag-Team Gauntlet" Match, which was won by Demolition. - CZW Winner Takes All (April 5, '08) = Player Uno & 2 Girls, 1 Cup fell to The Miracle Ultraviolence Connection (Brodie Lee, Cheech, & Cloudy). - CHIKARA Deuces Wild (April 19, '08) = Player Uno & Create-A-Wrestler were beaten by F.I.S.T. (Chuck Taylor & Icarus). - CHIKARA Passion And Persistence (April 20, '08) = Player Uno was pinned by Jimmy Olsen. - CZW Best of the Best 8 (May 10, '08) = In a non-tournament match, Player Uno & Beef Wellington lost to Up In Smoke. - CHIKARA Cafe Culture (May 17, '08) = Player Uno & Create-A-Wrestler fell to Shayne Hawke & Mitch Ryder. - CHIKARA Grit And Glory (May 18, '08) = The Super Smash Brothers lost to The Order of the Neo-Solar Temple (Tim Donst & Hydra). - CHIKARA Aniversarioma! (May 23, '08) = Player Uno, Shane Storm, Soldier Ant, & Cloudy defeated Stupified, Mike Quackenbush, Worker Ant, & Cheech. - CHIKARA Aniversarioct! (Super No Vacancy) (May 24, '08) = The Super Smash Brothers fell to Up In Smoke. - CHIKARA Young Lion's Cup VI, Night Two (June 14, '08) = In a non-tournament match, The Super Smash Brothers were beaten by Mike Quackenbush & Shane Storm. - CHIKARA Young Lion's Cup VI, Night Three (June 15, '08) = In a non-tournament match, The Super Smash Brothers lost to the CHIKARA Campeonatos de Parejas Champions, Incoherence. - CZW A Tangled Web (July 12, '08) = The Super Smash Brothers won a "Three Way" Match over Alex Colon & Joe Gacy and LJ Cruz & Ryan McBride. - CHIKARA Tragedy And Triumph (July 13, '08) = The Super Smash Brothers & The Colony (Soldier Ant & Worker Ant) fell to F.I.S.T. (Gran Akuma & Icarus) & The Osirian Portal. - CHIKARA All That Glitters (August 9, '08) = The Super Smash Brothers (Player Uno & Player Dos [formerly Stupified]) defeated The Osirian Portal. - CHIKARA Vanity And Violence (August 10, '08) = The Super Smash Brothers won over F.I.S.T. (Gran Akuma & Icarus). - CHIKARA Style And Substance (September 7, '08) = The Super Smash Brothers took down Buck Hawke & Mitch Ryder. - CHIKARA The Artistic Pursuit Of Being Yourself (September 20, '08) = Player Uno, Hallowicked, Icarus, Ophidian, & Worker Ant fell to Player Dos, Mike Quackenbush, Gran Akuma, Amasis, & Soldier Ant. - CHIKARA Laying In The Gutter, Looking At The Stars (September 21, '08) = The Super Smash Brothers won the CHIKARA Campeonatos de Parejas Titles, beating Incoherence. - CHIKARA The Global Gauntlet, Night Two (October 19, '08) = The Super Smash Brothers lost the CHIKARA Campeonatos de Parejas Titles, losing a "Three Falls" Match to The Osirian Portal. - RoH Bound By Hate (November 8, '08) = In a dark match, The Super Smash Brothers won over Ernie Osiris & Ninja Yellow. - CHIKARA Cibernetico Begins (November 15, '08) = The Super Smash Brothers defeated 2.0. - CHIKARA Armdrags To Riches (November 16, '08) = The Super Smash Brothers & Up In Smoke won over Los Ice Creams & 2.0. - CHIKARA Face With A View (December 12, '08) = The Super Smash Brothers & Ultimo Breakfest were beaten by F.I.S.T. (Gran Akuma, Chuck Taylor, & Icarus). - CHIKARA Duel And Duality (December 14, '08) = The Super Smash Brothers lost to The Osirian Portal (Escorpion Egipico & Ophidian). - CHIKARA King of Trios Tournament '09, Night Two (March 28) = In a non-tournament match, Player Uno won an "Inter Species Wrestling Showcase" Match over Twiggy. - CHIKARA King of Trios Tournament '09, Night Three (March 29) = In a non-tournament match, Player Uno & Create-A-Wrestler competed in a "Tag-Team Gauntlet" Match, which was won by Mike Quackenbush & Jigsaw. - RoH The Hunt Begins (April 17, '09) = In a dark match, The Super Smash Brothers took down Ernie Osiris & Dan Paysan. - CHIKARA Behind The Eight Ball (April 25, '09) = Player Uno, Vin Gerard, Buck Hawke, & Hydra fell to Player Dos, STIGMA, Brodie Lee, & Tim Donst. - CHIKARA The Bobliographon (April 26, '09) = The Super Smash Brothers lost a Four Way Tag-Team Elimination" Match to Up In Smoke. 2.0 and The UnStable (Colin Delaney & STIGMA) were the other participants. - RoH Never Say Die (May 8, '09) = The Super Smash Brothers fell to Kenny King & Rhett Titus. - RoH Validation (May 9, '09) = The Super Smash Brothers lost to Brent Albright & Erick Stevens. - CHIKARA Aniversario Yin (May 23, '09) = The Super Smash Brothers & The Colony (Fire Ant & Soldier Ant) defeated Los Ice Creams & The Osirian Portal. - CHIKARA Aniversario Yang (May 24, '09) = The Super Smash Brothers & Create-A-Wrestler fell to The Order of the Neo-Solar Temple (UltraMantis Black, Crossbones, & Delirious). - RoH Death Before Dishonor VII, Night One (July 24, '09) = The Super Smash Brothers were beaten by The Briscoes. - RoH Death Before Dishonor VII, Night Two (July 25, '09) = The Super Smash Brothers defeated Kevin Steen & El Generico. - CHIKARA Young Lions Cup VII, Night Two (August 15, '09) = Player Uno lost to Player Dos in the CHIKARA Young Lions Cup Tournament. Player Dos went on to win the tournament. - CHIKARA Young Lions Cup VII, Night Three (August 16, '09) = In a non-tournament match, Player Uno, Dasher Hatfield, & Yellow Dog defeated KC "Cloudy" Day & The Sea Donsters. - CHIKARA Man Makes Plans, And God Laughs (September 12, '09) = The Super Smash Brothers lost to The Order of The Neo-Solar Temple (UltraMantis Black & Delirious). - CHIKARA Hiding In Plain Sight (September 13, '09) = Player Uno lost to the CHIKARA Young Lions Cup Champion, Player Dos. - CHIKARA An Optimistic View Of a Pessimistic World (October 17, '09) = Player Uno fell to Claudio Castagnoli. - CHIKARA Cibernetico Increible (October 18, '09) = Player Uno competed in the "Torneo Cibernetico" Match, which was won by Carpenter Ant. - RoH Aries vs. Richards (November 13, '09) = The Super Smash Brothers fell to The Embassy (Joey Ryan & Erick Stevens). - RoH The Omega Effect (November 14, '09) = The Super Smash Brothers were beaten by Kenny King & Rhett Titus. - CHIKARA Three-Fisted Tales (November 22, '09) = Player Uno took down Tim Donst. - CHIKARA A Touch Of Class (January 31, '10) = Player Uno & The Throwbacks defeated The UnStable (Colin Delaney, Vin Gerard, & STIGMA). 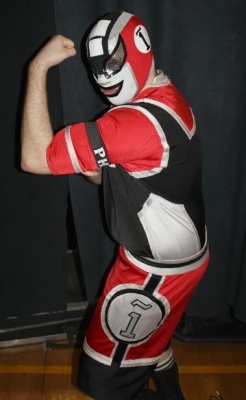 - CHIKARA The Mint Condition (February 27, '10) = Player Uno lost to the CHIKARA Young Lions Cup Champion, Tim Donst. - CHIKARA A World Of Comforting Illusions (February 28, '10) = The Super Smash Brothers lost a "Four Way Tag-Team Elimination" Match to The BDK (Swiss Money Holding). The Badd Boys and The Osirian Portal were the other participants. - CHIKARA Aniversario Elf (May 23, '10) = The Super Smash Brothers lost a "Four Way Tag-Team Elimination" Match to The Future Is Now (Equinox & Helios). F.I.S.T. (Gran Akuma & Chuck Taylor) and 3.0 were the other participants. - CHIKARA We Must Eat Michigan's Brains (June 26, '10) = The Super Smash Brothers fell to The Colony (Fire Ant & Soldier Ant). - CHIKARA Faded Scars And Lines (June 27, '10) = Player Uno lost to Johnny Gargano. - CHIKARA Young Lions Cup VIII, Night Two (August 28, '10) = In a non-tournament match, The Super Smash Brothers were beaten by 3.0. - CHIKARA The Dark Cibernetico (October 23, '10) = The Super Smash Brothers fell to The Batiri (Kodama & Obariyon). - CHIKARA Terror In The Neighborhood (October 24, '10) = The Super Smash Brothers lost to The BDK (Sara Del Ray & Daizee Haze). - PWG The Perils of Rock N' Roll Decadence (September 10, '11) = The Super Smash Brothers were beaten by The RockNES Monsters. - PWG Fear (December 10, '11) = The Super Smash Brothers fell to The American Wolves. - PWG World's Finest (March 17, '12) = The Super Smash Brothers won a "Three Way" Match over The RockNES Monsters and The Young Bucks. - PWG DDT4 '12 (April 12) = The Super Smash Brothers took down The Young Bucks, Future Shock, and 2 Husky Black Guys to win the DDT4.